Travel, photography, technology, and cupcakes. Best. Cat. Ever., originally uploaded by kmcgivney. My amazing cat, Jack, passed away last night after fighting advanced cancer. The first time I saw him, my then-partner and I were in the animal shelter, looking to adopt a cat. We looked at all the cute kittens and older cats, and then came to this big, regal black cat near the back of the shelter. He was facing to the side and we could only see the right side of his face at first. There was a little note pinned to his cage that said, "I hope you don't mind that I only have one eye." At the moment we read that note aloud, he turned to look at us. We were hooked the second that he looked at us with his perpetual wink. He was an incredibly sweet cat who loved cuddling and lounging on laps, and everyone who met him loved him. He will be deeply missed. So sorry to hear about Jack! Sending sympathy and love to you and Atom. Oh, I am so sorry to hear about Jack. He was an awesome cat. And the one eye just made him that much cooler. OH NO! One-eyed Jack! You were so sweet and such a good host when I visited you in November. I am so sad. Kathleen, this came on suddenly? I don't recall that he was sick less than a year ago. uph. So sorry to hear. Taking a moment to remember all things of the one-eyed cult. I'm sorry to hear about Jack. I have a two year old one-eyed border collie. One-eyed pets are the best! So sorry to hear about your loss of Jack. Lots of love to you and Atom. Oh no! 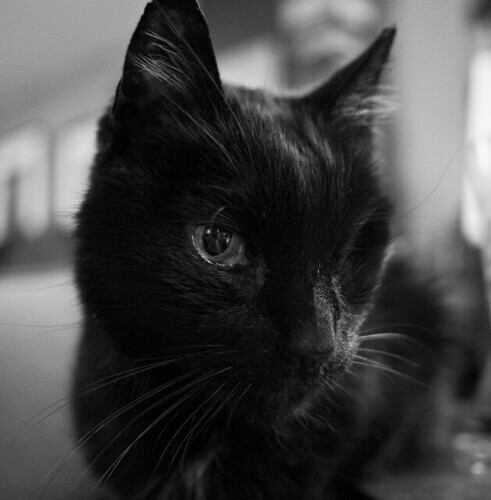 Raising a glass to One-Eyed Jack and the people who love him. Sorry to hear about Jack. He sounds like such a character. I lost my Toby to cancer 15 months ago. Loved him with all my heart and tearing up as i remember. Jack will be missed i know. What a handsome chap he was.